TFC is a simple game, especially compared to its predecessor. Two teams of nine mercenaries grab flags and kill each other, and that’s pretty much it. Contrast that to Team Fortress 2, where I’m hard-pressed to think of anything that hasn’t made it into the game in some fashion. 1) A bunch of popular TF2 maps. 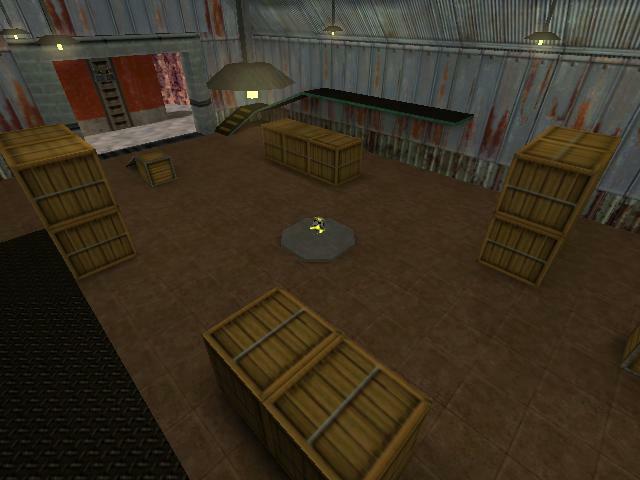 This one’s pretty common knowledge, but if you have no experience with TFC you may not know that a number of popular maps began as TFC maps, and before that Team Fortress Quake maps. The complete list is 2fort, dustbowl, well, and badlands. 2) The train. Except it can be ridden by the players. 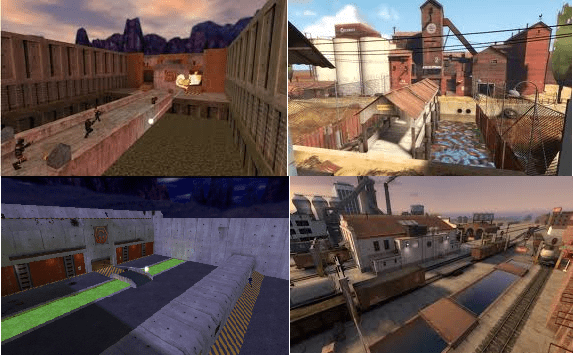 Due to their similarities, Half-Life Multiplayer maps can be transferred effortlessly into TFC, where they work as 4-team deathmatch arenas. Personally this is one of my favorite game modes in TFC because the complete dearth of ammo pickups means that I’m often forced to use weapons that I’m less familiar with as my tried-and-trues run out of ammo. My favorite map is Subtransit, which contains the trolly from Half Life as a major map feature. Players can get on the trolly and make it drive at three different speeds, and hitting enemy players who wind up on the track gib them spectacularly. It even gets it own unique kill icon! 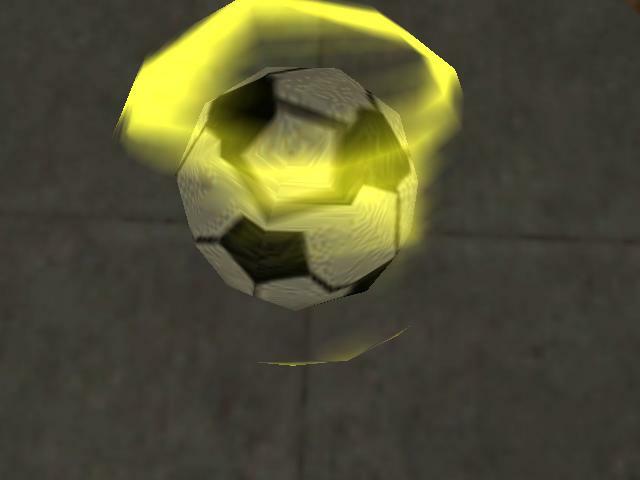 3) The soccer ball. Remember the Ball-Kicking Boots? I did an article on them. They are loads of fun, but the sort of non-serious fun that’s in TF2 but not TFC. Right? Behold the Hydro of Team Fortress Classic. Push is a phenomenally-popular kinda rare literally never-played map from Team Fortress Classic. It’s a variant on Capture The Flag where both teams have to breach a factory in the middle, grab a neutral flag, and bring the flag to the enemy capture point in their base. Of course, this may sound a bit like non-American football, and TFC wasn’t above lampshading that. Plus the ball came with a free Deadly Daffodil sheen! 4) Weapon sheens. Team Fortress Classic would use weapon sheens to tell other players information about things that may have happened recently to the glowing player. When you exited through a teleporter, your weapons glowed with Team Sheen for a few seconds. If you put on a biosuit in rock2, your weapons glowed Manndarin, like Gordon Freeman. That’s about as far as this one goes, and unlike TF2 sheens, they aren’t a form of customization. Customization definitely came into existence in TF2. 5) Character customization. Say what? 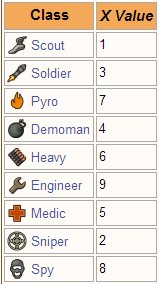 Team Fortress Classic, believe it or not, has exactly one form of customization, meaning that this definitely qualifies for the most-expanded upon aspect in TF2. Going to the Advanced Options menu allows you to toggle between “Old TFC Models” which lets you play as polygonal LEGO men, and “New TFC Models” which are the forms that appear in TF2 media and are more familiar to most. Sure it’s closer to the TF2 concept of styles than unlocks or cosmetics, but hey it’s still customization. By the way, in case you were wondering, I haven’t played TF2 in weeks and I’ve kinda run out of article ideas for it, so my next few articles are likely going to have a Team Fortress Classic bent to it. I hope everyone’s okay with that. There’s two other things I know of that are from TFC.